ventennio. A word which recurs often in anecdotal accounts of Mascagni in Italian is imbroglione. It implies someone who is shifty, a schemer, an intriguer; someone who is always looking for an advantage. Mascagni was a volatile, difficult, often undisciplined person, confrontational and obstreperous. He was the cause of much turmoil both in and out of the opera house. He had his admirers and acolytes but they were usually people he perceived as no threat to his artistic standing. 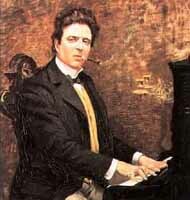 Mascagni's main focus was the care and feeding of Mascagni, and since he was uncharacteristically improvident for a Tuscan, that required a fair amount of revenue. Always seeking the advantage had led him to compose freelance. He never aligned himself exclusively with one publisher, so lacked the support and advocacy the likes of which Ricordi provided its composers. scopone), Mascagni, thinking he held all the cards, hazarded a political wager. Always a somewhat craven self-promoter, Mascagni secured an audience with Mussolini a few months after the 'March On Rome'. This was primarily to dispel the odour of socialism which had attached to him because of friendships with prominent members of the party and some remarks made in 1920 in support of striking shipyard workers in his hometown of Livorno. The right-wing press, including Mussolini's Il popolo d'Italia, denounced what it called 'Mascagnian Bolshevism' in the wake of those remarks. So the possibility was real that the former newspaper editor now in power might make his life difficult, even ban his works. 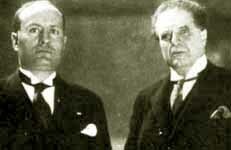 Though he did not formally join the Fascist Party until 1932, Mascagni began to accept honours, offices, and appointments from the regime, to compose and conduct music for official functions, and to appear on the podium in the fascist black shirt. He was even subsidized by the infamous MinCulPop (Ministry of Popular Culture) to the tune of 1,290,000 lire by the fall of the regime in 1943 (a sum nine times more than any other artist received). Harvey Sachs - Toscanini biographer and scholar of music in fascist Italy - calculated that this was equivalent to $700,000 in 1987 dollars. Mascagni was politically naive and personally obtuse. He used the regime and allowed himself to be used by it, always thinking he had the upper hand and never with any regard for the consequences. Some of those consequences were brought home when his son died in East Africa in 1936, a casualty of the Ethiopian campaign, and when his villa in Livorno was sacked by the Germans during the occupation. Mascagni's active importuning diminished after his son's death, but he still relied on the regime to sustain him. Lina Brusa Rasa, Mascagni's favourite Santuzza. She also created the role of Atte in Nerone. That sustenance vanished when Mussolini was deposed. When the Allies entered Rome, he found himself in restricted circumstances though not penniless as has often been said. The Hotel Plaza, which had been his Rome residence for over 20 years, was commandeered by the French. He faced eviction like everyone else until the French realized who it was who lived in the ground floor corner suite. He was the only private citizen allowed to stay and was looked after kindly by the French and his family until he died in August of 1945. Though there was no official government recognition or participation, Mascagni's funeral attracted a crowd estimated at over 100,000 people. 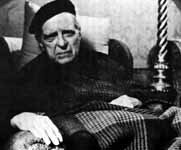 The last photograph of Mascagni, taken in July 1945 by his friend Luigi Ricci.